Why choose Sky Collision Repair Winder for your auto body repair? If you’ve been in an accident and need a professional auto collision repair shop, Sky Collision Winder Ga. is the best choice. We are I-CAR certified. We offer a free estimate, lifetime guarantee and direct billing to insurance. We’ll even provide assistance with your car rental! Winder makes up a small part of the metropolitan area of Atlanta. Just like any other city in the Barrow County, rush hours can be crowded in Winder causing frustration in the drivers on the road. Driving in such conditions can often result in minor to major collisions and property damage. At Sky Collision, we are your professional auto body Winder shop to help get your vehicle back in shape. You can trust us for providing you the best collision repair services in Winder. Our professionally trained and certified technicians can give you the following repairs services. We provide you a complete list of auto body shop services from windshields to the trunk and bumper of your vehicle. We use modern tools and employ only the professionally trained technicians to do your vehicle’s body repair. Let our professionals take care of the repair work even if the damages seem irreparable to you. Sometimes, the dents are fixable without any damages to the paint of the car. Both types of dents, small and large, are repairable without technicians doing any damage to the paint. Only the most experienced technicians can perform paintless dent removal and we have them on our teams. Our customers always return to us because of how reasonably we price our services. Whether you need severe collision repairs, paintless dent removal or minor work to get rid of the scratches and scuff marks, our services will be light on your pocket. We believe in professionalism and your trust in our services is important to us. Our technicians are consistently good with their repair works because they have received the required professional training. We have ASE and I-Car certified professionals on our teams to ensure we deliver only the best-in-class repair services to you. We like to treat our customer especially. We will go out of our way for the convenience of our customers. Let us come to you to pick up your vehicle if you are within a 25-mile radius from us. In addition to that, have an online form for you to receive free initial repair quote from us without even visiting the shop. And to ensure the maximum peace of mind for you, we have put a lifetime guaranty on our repair works. We let our thirty years of experience speak through our work. We make sure your vehicle looks like new again after we have fixed it. From windshield repairs to frame correction and hail damage removal, we are your trustable collision repair Winder shop for the most promising repairs. Do you own a sedan for your daily office commute or an SUV for a powerful driving experience? Do you like the spaciousness of a luxury car or the compactness of a hatchback? The type of vehicle you own is not a problem for us. If it needs repairs, we are here to fix it. Get in touch with us for professional collision repair Winder Ga.. Here is the online estimate form for you to get a repair estimate for your vehicle. Feel free to call us at (678) 475-7499 for any other inquiries. 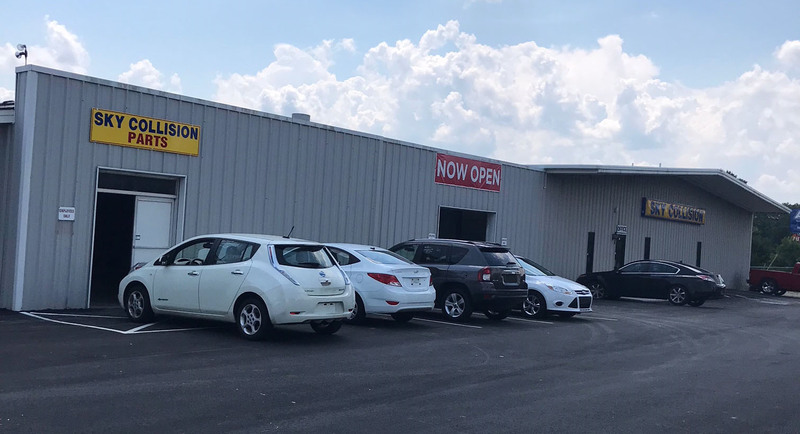 If you’ve been in an accident and need a professional auto collision repair shop, Sky Collision in Winder is the best choice. We are I-CAR certified. We offer a free estimate, lifetime guarantee and direct billing to insurance. We’ll even provide assistance with your car rental! Great place! Have used them in the past and will use them in the future. Ready before they said it would be, reasonable prices, excellent service. John did such a great job with my vehicle. He made the process simple and he went above and beyond. I will definitely use Sky Collision if I ever need my car fixed again! Thanks! I would recommend this body shop!!! I took my Explorer there last week. The whole back of my car was smashed. I was very upset about it, and Josh was very nice. He helped me with the insurance claim and handled everything! When I picked up my car, it looked brand new again! Thanks Josh and everyone @ Sky Collision! I just got my Lincoln blackwood truck out. I'm very pleased. These guys did a great job and kept their word. I highly recommend these guys. Do you love your car but need a fresh paint job? Do you need dents repaired or even a car detail? Sky collision in Monroe made my car look brand new and I am very happy with the results. They are not only local but professional and their customer service is outstanding. Give them a call.